Scion should be collected off plants that are true-to-type and disease-free. Prune the trees when they are dormant in winter. Note that you should dip the secateurs in methylated spirits between each tree. This is to sterilise the secateurs and so avoid transmitting infections. You want last year’s growth – pencil thickness (preferably 3 – 6mm diameter, or up to 8mm maximum diameter), approx 15cm long. If the piece you are going to prune off is longer than 15cm, just cut it into 15cm lengths … BUT you need to know which is the top and which is the bottom, so make a diagonal cut at the top of each piece and a right angle cut at the bottom of each piece. Place the scion in a medium-sized 18x17cm ziploc bag, add about a tablespoon of water, shake it around and tip out excess, get all the air out, and seal it. Note that it is best not to dip the scion in a bucket of water before storing it, due to the risk of cross-infection. Using a laundry marker felt-tip pen, write the name of the variety on the outside of the bag, along with your initials. Store horizontally in the fridge – NOT the freezer. The wood will keep for several months like that. 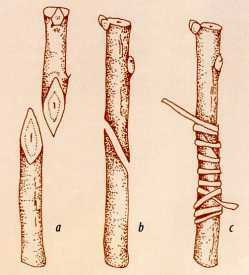 Regarding storage of rootstock for grafting, wet the roots as soon as possible and cover them with moist soil. The rootstock should then be planted in fertile soil in a spot where they will get very well cared for over the first year. A good idea is to plant the grafted trees in your vegie garden, and then after 12 months transfer them to their definitive place in your garden during the next winter. We should be able to start collecting apple and pear scion from now on. If we can standardise scion collection it will make a lot of things easier. If we can all use the press seal sandwich bags and cut the scion so it will fit in across the bottom of the sandwich bag it would allow a number of bags to be placed one on top of the other with a small part of the seal unsealed they can be rolled up tight and have a rubber band placed around the whole roll. Then cut up your scion as long as you can to get it in the bag, put in as many as you think can be used (we will be needing a lot of scion this year if you would like to share it around) put in some water, shake it around and tip out excess water. Remove as much air as you can and roll up bundles of bags then put a rubber band around them. Sterilize secateurs with methylated spirits after each tree to avoid spreading viruses. Store in the fridge until needed but don't put it in the freezer.